The Argus sat down with Professor Cybele Moon to discuss her costume work for the faculty show. This year’s faculty show, “Marisol,” premiering this weekend, is a post-apocalyptic play about the earthly repercussions of a war in heaven. 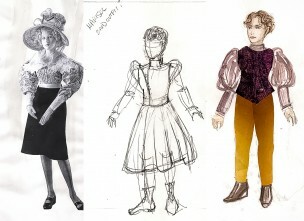 The production will showcase unconventionally timeless costumes, designed by Professor Cybele Moon. In addition to being the costume designer for “Marisol,” Cybele is a visiting Assistant Professor of Theater currently teaching Introduction to Costume Design for Performance. In addition to class, much of her semester has been spent in the costume shop sharing her design process with students like me. Next semester, Professor Moon will be teaching “Text and the Visual Imagination” and “Analysis of Clothing,” a costume history class. The Argus sat down with Moon to discuss her techniques and design process. The Argus: Can you describe your process for designing this show? How was this different from previous shows you’ve designed? Cybele Moon: I am working with Eddie Torres, the director for this show. He was my main contact to begin my process for making costumes. When I first talked to Eddie, I asked him what he was looking for in the costumes. He was looking for a variety of time periods mixed together, and he gave me a time frame, 1600 – 2000. I needed to research all of the costumes from those four hundred years of history! So…that was a lot of work. Once I pulled together images from each of the different centuries, I showed them to Eddie, and asked him, “Okay, what are you interested in? What silhouettes do you respond to?” He and I looked over the pictures together, and he chose ones that felt like characters to him. After that, I took those images as well as others from those 400 years of costume history, and started collaging them together to see what those different time periods look like. I don’t know what taking something from 1940, and putting it with something from 1660 looks like until I start collaging them together. It was literally xeroxing pictures, xeroxing pictures of paintings, cutting them out, gluing them together. Just playing, playing with pictures. It was an experiment. Because we had such a wide range of possibilities, starting to narrow it down was definitely more complicated than it might usually be. You usually say, “Things need to be from the 1850s!” Having 400 years gives you so many options. It’s amazing, but definitely a challenge to be able to pull together silhouettes that then need to be who the characters are. The collaging process happened. I showed these to the director, got his response. He liked them. That was good. And then, from there, I started trying to figure out really what silhouettes from what century worked for each character. A: And your next step was sketching the ideas developed from collaging. CM: That was ages ago! This was a sketch of Marisol [the character], and I was actually looking at costumes for women from the 1890s: a very fitted bodice with big puffy sleeves. This would’ve been something from the time period that women would’ve worn a corset under [their bodices]. The skirt that I was looking at in this particular sketch was actually a poodle skirt from the ’50s , the boots, more 1890s. So really mixing together two totally different time periods. That was a starting off point for Marisol. I began there. With this one in particular, I realized after I watched a run-through that she was going to be doing a lot of moving, getting up and sitting down. Using a big skirt for Marisol was not going to work so well. That was something that changed from the sketch to the rendering. A: Tell me more about each decision for each piece and the changes you made at this point in the process. CM: We kept the shape of the bodice, so it’s still an 1890s bodice. The sleeves got much bigger…. They’re called leg o’mutton sleeves. They’re big and puffy at the shoulders and fitted at the wrists. And the pants, I again went back to the 1950s, now she has pegged pants. They’re fitted pants that women would’ve worn in the 1950s, casual wear for women. I designed the top first. I realized I had a color range of pinks to purples and I wanted something that contrasted from that for the lower half of her body, and I chose gold. It may have been something on my table with collage things and I was like, “I think this looks awesome together!” So that’s how it happened. The shoes, at the time I was going to give her some platform shoes, but since I’ve given her heels that are more comfortable. A: What materials are used in this rendering? CM: The rendering for Marisol is a mix of watercolor and collage. Even when I got to the final process of creating the renderings, I really wanted to mix together different ideas. So, I mixed together watercolor, which I can be really precise with, and collage, which is more found materials, found colors, found textures, I still wanted to keep some randomness to it. As an artist, I can choose all the elements that I want to go in a rendering but I wanted to allow some variation. A: Why do you think this costume and this silhouette encompass Marisol as a character? CM: That’s a good question! I believe when you’re making art, the art’s ahead of you. It’s like you’re creating so many things, just going through the processes, and sometimes things come out, and you’re like, “Yep, that totally works.” Not quite sure if I have a reason why. But I think it’s that we know that part of this garment is in a specific time period that is not 2015. The pants look like pants people are wearing now, but that’s okay because we can relate. But the colors are not everyday colors and the fabric we chose for the bodice and the sleeves of the outfit are a little more extreme. It felt right. In the end, it felt right. Going through the process, you keep adding, and subtracting, and this is where we went.